Have you switched from Mac to Linux and miss the Mac OS X-style launcher? Or, maybe you just want a dock other than the Unity Launcher on your Linux machine. Cairo-Dock is a customizable dock you can add to your Linux desktop. 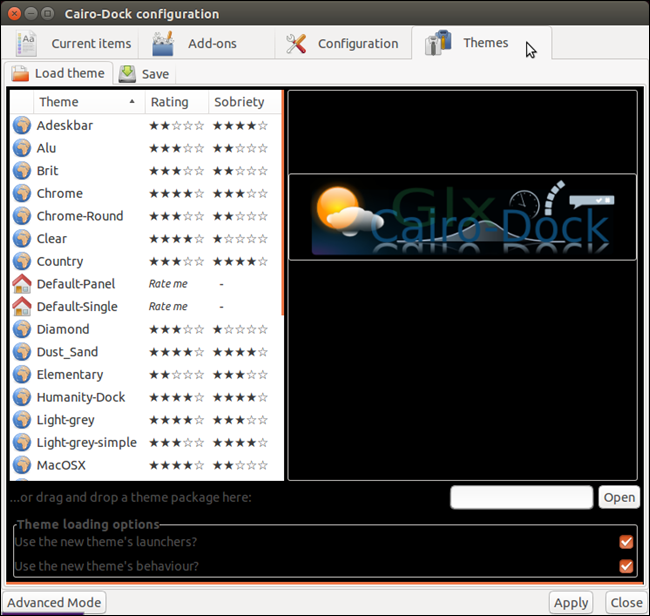 Cairo-Dock is available in the Ubuntu Software Center. To open the Software Center, click the orange suitcase icon on the Unity Launcher. Click on “Cairo-Dock” and then click the “Install” button. The progress of the installation displays above the “Install” button. When the installation is finished, the “Install” button becomes the “Remove” button allowing you to uninstall the application, should you need to. To close the Ubuntu Software Center, click the “X” button at the upper-left corner of the window. An icon for Cairo-Dock is added to the Unity Launcher. Click the icon to start Cairo-Dock. A dialog box displays asking if you want to use OpenGL when running Cairo Dock. This option allows you to use hardware acceleration and to take advantage of some pretty visual effects. However, your graphics card may not support it. We recommend you leave the “Remember this choice” check box unchecked so you can choose not to use OpenGL next time you open the dock, if it doesn’t work. Click “Yes” if you want to use OpenGL in Cairo Dock. A Welcome message displays. Click on the message to close it. Before using Cairo-Dock, you need to restart your system. Click the power button on the right side of the dock. Select “Restart” from the popup menu. A confirmation dialog box displays to make sure you want to restart your computer. Click the check mark to restart. Once you have rebooted and started up Cairo-Dock, you probably want to start configuring the dock to your liking. To do this, right-click anywhere on the dock, select “Cairo-Dock” from the popup menu, and then select “Configure” from the submenu. The “Cairo-Dock configuration” dialog box displays with the “Configuration” tab active. The “Behavior” sub-tab allows you to change settings such as the dock’s position on the screen, the visibility of the main dock and sub-docks and the behavior of the Taskbar. Click the “Appearance” sub-tab to choose a theme for the icons and the view for the main dock and sub-docks. Click the “Current items” tab to change settings for the items currently on the each dock. Click an item in the left pane to access settings for that item in the right pane. Click the “Add-ons” tab to choose which add-ons to enable on the dock. The right pane displays a description of the currently selected add-on. To change the theme on the dock, click the “Themes” tab. There is a list of themes that comes with Cairo-Dock and you can load other themes as well. To close the “Cairo-Dock configuration” dialog box, click the “X” button in the upper-left corner of the dialog box. 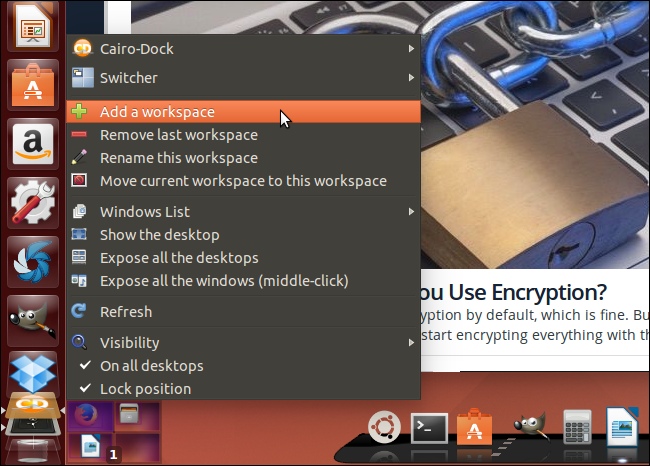 Cairo-Dock also includes the Workspaces feature of Ubuntu, making it easily accessible. By default, the workspaces tool icon is placed to the right of the main dock. To move to another workspace, click the desired workspace on the icon. Notice that the name of the workspace highlighted above is different than the default name given to that workspace. You can easily change the names of the workspaces. To do so, right-click on the workspace for which you want to change the name and select “Rename this workspace” from the popup menu. A dialog box displays allowing you to enter a new name for the workspace. You can also add workspaces. 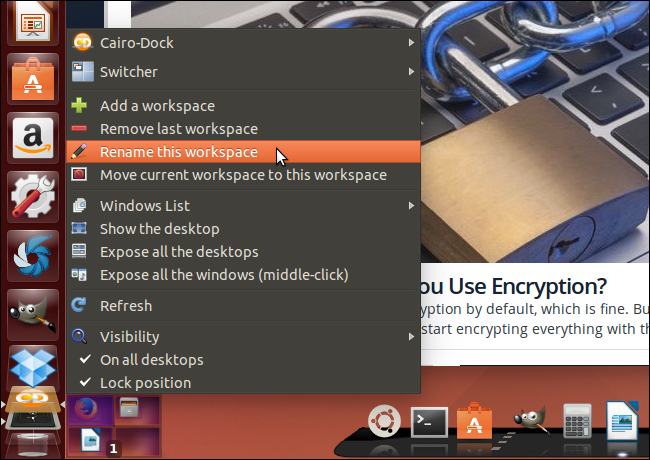 To do this, right-click on any of the current workspaces on the icon and select “Add a workspace” from the popup menu. For some reason, Cairo-Dock adds two workspaces at a time. By default, they are named as numbered desktops. Use the Rename feature to rename these workspaces, if you want. By default, the workspaces feature is separate from the main dock. However, you can place the workspace tool on the main dock. To do this, right-click on the workspaces tool icon, select “Switcher” from the popup menu, and then select “Return to the dock” from the submenu. 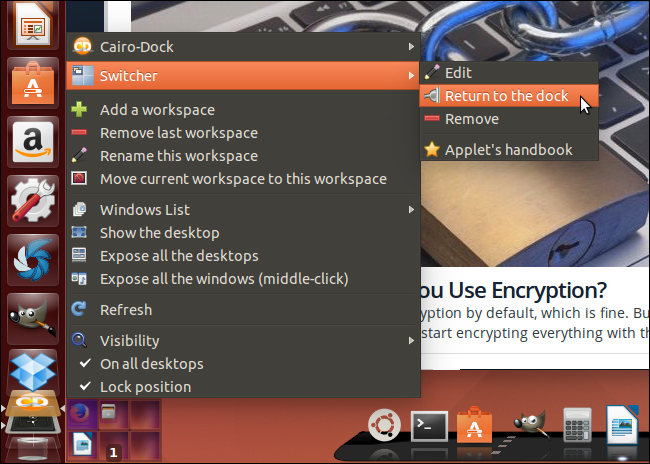 To close Cairo-Dock and remove it from your Ubuntu desktop, right-click anywhere on the dock, select “Cairo-Dock” from the popup menu, and then select “Quit” from the sub-menu. On the “Quit Cairo-Dock” confirmation dialog box, click the check mark.